Every week we make Chili in one form or the other. Here is a bean lovers Chili if I ever saw or had one. This has just about every bean imaginable all in one pot and very very tasty! We were pleasantly surprised how hearty and satisfying this was! Hope you like it too! 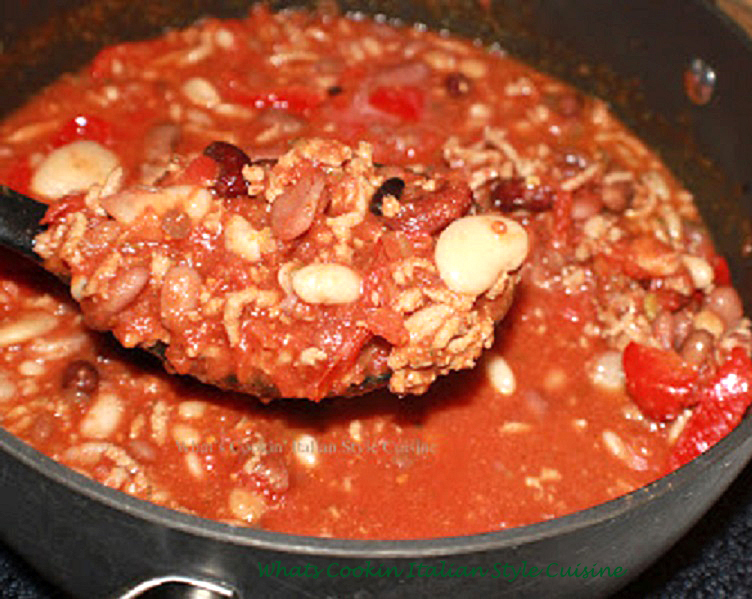 If not check out the links below for more recipes making Chili! In a large sauce pan add 3 tablespoons garlic, saute for 1 minute. Add the meat, celery, peppers for another 3 minutes until the pink is gone from the meat, drain most of the oil out. Add the sauce, herbs, seasonings to taste, Worcestershire sauce, sugar. Stir in beans. Simmer on low for 2 hours or the lowest settings or use a crockpot for 4 to 6 hours. Serve with shredded cheddar, mexican blend or your favorite shredded cheese and sour cream. Great with tortilla chips crushed up too! Don't forget to whip up a batch of Tex Mex Muffins that go perfectly with this Chili! Click Here for the recipe.